9. Cardiovascular Research Institute, Division of Cardiovascular Diseases, Department of Internal Medicine; Department of Biochemistry and Molecular Biology, University of Kansas Medical Center, Kansas City, KS. Extracellular vesicles (EVs) are small bilayer lipid membrane vesicles that can be released by most cell types and detected in most body fluids. EVs exert key functions for intercellular communication via transferring their bioactive cargos to recipient cells or activating signaling pathways in target cells. Increasing evidence has shown the important regulatory effects of EVs in cardiovascular diseases (CVDs). EVs secreted by cardiomyocytes, endothelial cells, fibroblasts, and stem cells play essential roles in pathophysiological processes such as cardiac hypertrophy, cardiomyocyte survival and apoptosis, cardiac fibrosis, and angiogenesis in relation to CVDs. In this review, we will first outline the current knowledge about the physical characteristics, biological contents, and isolation methods of EVs. We will then focus on the functional roles of cardiovascular EVs and their pathophysiological effects in CVDs, as well as summarize the potential of EVs as therapeutic agents and biomarkers for CVDs. Finally, we will discuss the specific application of EVs as a novel drug delivery system and the utility of EVs in the field of regenerative medicine. Keywords: Extracellular vesicles, exosomes, microvesicles, cardiovascular diseases, therapeutic agents, biomarkers. Recent advances in biomedical research have revealed that extracellular vesicles (EVs), once thought to be cell debris, are emerging as novel mediators of communication between cells. EVs were firstly described as “minute particulate material” coming out of platelets several decades ago [1, 2]. Additional studies found that EVs were released by other cells as well as cancer cells and red blood cells [3-6]; however, it was only the late 90s when researchers discovered that EVs are involved in functional communication between cells. Raposo et al., found that EVs from B lymphocytes transformed with Epstein-Barr virus could trigger an antigen-presenting response by T-cells . Following this discovery, several other groups showed that EVs are involved in functional intercellular communication by transferring RNAs (e.g. mRNAs and microRNAs) and proteins between cells [8-11]. To date, EVs have been found to be released by most cell types and detected in almost all biofluids, including blood, urine, follicular fluid, saliva, breast milk, and cerebrospinal fluid in vertebrates [12-17]. Because of their critical roles in intercellular communication and their presence in most body fluids, EVs have been increasingly investigated in pathophysiological processes and as biomarkers in cardiovascular diseases (CVDs) and associated metabolic diseases [18, 19]. CVDs cause both health and economic burdens globally, among which coronary heart diseases, stroke, heart failure, and high blood pressure represent the leading causes of death attributed to CVDs . Increasing evidence has shown the important regulatory effects of EVs in cardiovascular biology and disease. In this review, we will first outline the current knowledge about the physical characteristics, biological contents, and isolation methods of EVs. We will then focus on the functional roles of cardiovascular EVs and their pathophysiological effects in CVDs, as well as summarize the potential of EVs as therapeutic agents and biomarkers for CVDs. We will also discuss the specific application of EVs as a novel drug delivery system and the utility of EVs in regenerative medicine. The term EVs is used to describe distinct sub-types of characterized small bilayer lipid membrane vesicles. There are 3 major sub-types of EVs that are usually differentiated by their mechanism of biogenesis, as well as their size. Exosomes (40-100nm diameter) are vesicles with endosomal origin that are encapsulated in larger multivesicular bodies and released in the extracellular space following fusion of multivesicular bodies with the plasma membrane ; microvesicles (100-1000nm diameter) are vesicles that bud out in the extracellular space directly from the plasma membrane  (Figure 1A). Both exosomes and microvesicles are considered as active vehicles of cellular communication because they are released and taken up by living cells. On the contrary, apoptotic bodies (>800nm diameter) arise from the outward blebbing of the plasma membrane of cells undergoing apoptosis . Although size is often used to generically classify sub-types of EVs, we must note that there is no consensus so far on a strict cut-off. In fact, whether exosomes with a diameter of >100nm or microvesicles with a diameter of <100nm exist is an ongoing investigation. Indeed, EVs are more frequently and generally used than either exosomes or microvesicles. Nonetheless, many methods, including nanoparticle tracking analysis, transmission- and cryo-electron microscopy, and nano-flow cytometry have been recently developed to analyze the shape, size, and counts of EVs . Extracellular vesicles (EVs) with different contents can be released from cells (A) Early endosome-derived internal multivesicular bodies (MVB) either fuse with lysosomes or fuse with the plasma membrane to release exosomes(40-100 nm diameter); microvesicles (100-1000 nm diameter) are vesicles that bud out in the extracellular space directly from the plasma membrane. (B) Schematic representation of EV cargos, including proteins (e.g., exosome surface proteins such as CD9, CD63, and CD81), lipids, nucleic acids, and non-coding RNAs (e.g., microRNA and lncRNA). ER, endoplasmic reticulum. Blood circulating EVs provide an unprecedented opportunity to minimally-invasively access biological signals from cells/tissues in the context of cardiovascular research studies. Collection and processing of blood samples prior to EV isolation is of critical importance and several factors should be taken into consideration for optimal results. First, the choice of anticoagulant should be decided according to desired downstream applications. Notably, the type of collection tube, the temperature at which the plasma is processed, and the degree of hemolysis can all critically affect analysis of EV quantity and content [25-27]. The minimal experimental requirements for EV preparation and characterization have been proposed by the International Society for Extracellular Vesicles (ISEV) . Isolation of EVs from blood can be achieved by multiple methods; however, in this review we only summarize the most commonly used and well-established methods. In differential centrifugation, blood is centrifuged at room temperature and low speeds (1000-2000 x g) to separate plasma from blood cells. Cell-free plasma is further centrifuged at higher speeds (10,000-20,000 x g), which allows enrichment of large EVs. The supernatant is carefully recovered and centrifuged at 100,000-120,000 x g at 4°C, where small EVs precipitate as pellet . Although this method enriches for EVs, other contaminants (e.g., protein complexes/aggregates, viruses, and lipoproteins) may co-precipitate with EVs in the pellet . To increase purity, the pellet can be washed in PBS and re-centrifuged at 100,000-120,000 x g at 4°C . Noteworthy, absolute separation of the different sub-types of EVs is currently not possible using differential centrifugation, with the efficiency being highly dependent on the rotor k-factor. Thus, the rotor type and its k-factor used for EV isolation are necessary to be mentioned in publication. Density gradient centrifugation is another method used when higher purity of EVs is desired. In general, cell-free plasma is laid on sucrose cushion/gradient and centrifuged at 100,000-120,000 x g for 16-18 h at 4 °C . Due to their unique buoyant density (1.10-1.19 g/ml), EVs can be separated from other contaminants that may be present [7, 30]. In cases where a biologically inert substance is preferred, iodixanol can be used instead of sucrose . While this method allows for the recovery of higher yields of pure EVs than differential centrifugation, it requires extra time and is labor-intensive. Filtration-based methods are also being used for the isolation of EVs based on their size. Cell-free plasma is filtered through membranes of various pore sizes in order to separate smaller from larger EVs, as well as EVs from proteins, viruses, and other soluble components present in the plasma. While this method is simple, cheap and yields relatively high numbers of EVs, concerns have been raised about the structure of recovered EVs as they are forced through the membrane, in addition to similar size contaminants that can pass through the membrane filters together with the EVs . Affinity-based methods represent another way to isolate EVs that is based on the presence of specific proteins on their membrane surface (e.g., exosome surface proteins such as CD9, CD63, and CD81) [29, 32]. Antibodies or other molecules conjugated with beads bind to the surface proteins of EVs and with the use of magnetic tools or low-speed centrifugation, EVs can be isolated. This method is highly selective and can be used to specifically isolate EVs originating from different cell types (e.g., platelets and red blood cells); however, it requires a priori knowledge of unique proteins of the cell type of interest that are also present on the membrane surface of EVs, and the yields of recovered EVs are considerably low as compared to other methods . Lastly, precipitation-based methods can also be used to isolate EVs from plasma. In general, a polymer-containing solution is added to the sample and after a short incubation step EVs precipitate and form a pellet. These methods require relatively lower volumes of plasma for EV isolation and a fraction of the time that other methods require. However, concerns have been raised about the purity of EVs, as well as about the presence of carry-over polymers that may interfere with downstream analyses . In summary, all methods have their pros and cons. We therefore recommend that investigators weigh the following factors prior to choosing the appropriate method for their research: (a) sample type, (b) sample volume, (c) sample condition, (d) number of samples to be processed, (e) need and proximity to special equipment, (f) purity and yields of EVs desired for downstream procedures, (g) sample processing time, and (h) cost per sample. Due to the lack of standardization in EV isolation, the study-to-study comparability and reproducibility is still far from satisfactory. Indeed, the improvement of EV isolation and purification technique is urgently needed, which allows further investigation for biological functions of EVs as well as their potential in clinical application . A set of considerations and recommendations from sample collection to EV isolation, detection and characterization have been proposed and thoroughly reviewed . Moreover, the EV-TRACK knowledgebase has recently been established to collect experimental parameters of EV studies to enable interpretation and reproducibility of experiments . Prior to their release from the parent cells, EVs encapsulate a broad range of biological molecules (Figure 1B). It is well established that EVs have an abundant cargo of proteins, including proteins that originate from the plasma membrane, cytosol, cytoskeleton, and proteins involved in vesicle trafficking . Some proteins are commonly found on the surface of exosomes, including CD63, CD81, CD9, and TSG101 . To date, no universal marker of EVs has been identified so far. In addition, there are other surface proteins that have been found to be only present in EVs originating from specific cell types. For example, CD62 is only found on the membrane surface of EVs from activated platelets , or PLAP is only found on the membrane surface of placenta-derived EVs . Another group of proteins that is usually found in blood circulating EVs is cytokines (e.g., IL-1b, IL-6, TGF-β, and TNF) [39-42]. In addition to proteins, EVs and especially their membrane are enriched in lipids such as sphingomyelin, phospholipids, and cholesterol . The presence of these lipids in the membrane of EVs is usually higher compared to their cells of origin, which is the reason why EVs have a more stable structure than their parent cells. EVs also contain other lipids such as fatty acids and eicosanoids that have been found to have a functional role in the recipient cells . Lastly, EVs contain considerable amounts of nucleic acids (e.g., RNA and DNA) as well. Most of the research so far has been focused on different types of RNA in EVs, with microRNAs (miRNAs, miRs) being the most abundant and well-studied. Other types of RNA in EVs are small nucleolar RNAs, piwi-interacting RNAs, long non-coding RNAs, tRNAs and tRNA fragments, Y-RNAs, ribosomal RNAs, mitochondrial RNAs, and messenger RNAs [45-47]. Fewer studies have focused on DNA in EVs, despite the fact that several types of DNA are encapsulated in EVs, including cellular, oncogenic, mitochondrial, and viral DNA molecules [48-51]. Myocardial injury induces cardiomyocyte (CM) hypertrophy, which is initially a group of adaptive responses to stress factors leading to CM enlargement and protein synthesis to compensate for myocardial injury . When stress factors are chronic, CMs undergo apoptosis and necrosis and cardiac tissues display a remodeling process associated with fibroblast (FB) proliferation and activation and an enhanced expression of extracellular matrix proteins, which can ultimately lead to cardiac fibrosis and heart failure . EVs exert key functions for the intercellular communication of proximal and distant cells including cardiac cells, and have been involved in the regulation of cardiomyocyte hypertrophy, apoptosis, cardiac fibrosis, and angiogenesis. . Regarding cardiac hypertrophy, a high level of miR-21-3p was found in the pericardial fluid of mice with transverse aortic constriction-induced hypertrophy compared to sham-operated mice, and miR-21-3p inhibition using miR-21-3p antagomir was able to block angiotensin II-induced cardiac hypertrophy . During high stress, miR-21-3p was abundant in FB-derived exosomes, which then carried this molecule to neighboring CMs, affecting target genes and thereby leading to cellular hypertrophy . miRNA can bind to the complementary sequences on target mRNA, and so have pivotal roles in the posttranscriptional regulation of gene expression, causing translational repression or target degradation and gene silencing [56, 57]. The same study also showed that miR-21-3p was involved in the downregulation of SORBS2 and PDLIM5 leading to CM hypertrophy . It was also reported that angiotensin II treatment of FBs could enhance the release of exosomes, which further induced CM hypertrophy in vitro via activation of Akt and mitogen-activated protein kinases (MAPKs) and increased expression of the renin angiotensin system (RAS) in CMs . The FB exosome proteins osteopontin (Spp1) and epidermal growth factor receptor (EGFR) were supposed to activate PI3K/Akt and MAPK cascades leading to the upregulation of RAS in CMs .Indeed, FB-derived exosomes play a critical role in the crosstalk between CMs and FBs during the hypertrophic process [59-61] (Figure 2A). When cardiac stress (e.g., ischemia, hypoxia, hypertension) persists, cardiomyocytes undergo apoptosis and necrosis, which is a key pathological process leading to cardiac dysfunction and eventually heart failure. Evidence has accumulated that stem cell-derived EVs exert a protective effect against CM apoptosis during myocardial infarction and ischemia/reperfusion injury [62-64]. Importantly, genetic modification of stem cells may further enhance the anti-apoptotic effect of EVs. One example was that GATA-4 overexpressing mesenchymal stem cell (MSC)-derived exosomes could protect against CM apoptosis in ischemic myocardium by upregulating miR-19a. Mechanistically, PTEN, a predicted target of miR-19a, was reduced in CMs, which resulted in the activation of Akt and ERK signaling pathways . Exosomes derived from heat shock protein 20 (HSP20)-overexpressing CMs also protect against the hyperglycemia-induced CM death through increased levels of HSP20, p-Akt, survivin, and superoxide dismutase 1 (SOD1) . Noteworthy, exosomes isolated from the plasma of healthy individuals are also able to protect against CM apoptosis and ischemia/reperfusion injury by activating a pro-survival signaling pathway involving Toll-like receptor 4 (TLR4) leading to the activation of cardioprotective HSP27  (Figure 2B). Interestingly, exercise can further enhance the beneficial effect of circulating EVs in reducing CM apoptosis by increasing EV counts . Myocardial injury induces CM hypertrophy and death and also triggers multiple responses to repair and maintain cardiac integrity, including cardiac fibrosis, while excessive and uncontrolled fibrosis may progressively develop to cardiac remodeling. The major effector cells of fibrosis are activated FBs called myofibroblasts, a highly contractile cell type characterized by the appearance of α-smooth muscle actin stress fibers. Myofibroblast differentiation involves a complex signaling network containing transforming growth factor-β (TGF-β), endothelin-1 (ET-1), angiotensin II (AngII), connective tissue growth factor (CTGF), and platelet-derived growth factor (PDGF).Hypertrophic myocytes may also cause FB collagen production via paracrine effect [69, 70]. Myocyte-derived exosomal HSP90 together with secreted IL-6 were involved in the activation of STAT-3 signaling in cardiac FBs, leading to increased collagen production and deposition during cardiac hypertrophy . Cardiomyocyte-derived exosomes from exercised diabetic mice expressed high levels of miR-29b and miR-455 compared to sedentary ones, which had the capacity to reduce cardiac fibrosis by downregulating MMP9 in diabetic heart  (Figure 2C). Extracellular vesicles (EVs) in the crosstalk of cardiac cells (A) FB-derived exosomes enriched with miR-21-3p or Spp1 and EGFR proteins are transferred to CMs, leading to CM hypertrophy. (B) EVs secreted from CMs or MSCs, as well as circulating EVs exert regulatory effects on CM apoptosis. (C) CM-derived exosomal HSP90 together with secreted IL-6 are able to activate STAT-3 signaling in cardiac FBs, leading to cardiac fibrosis; whereas CM-derived exosomes from exercised diabetic mice express high levels of miR-29b and miR-455, thus reducing cardiac fibrosis. 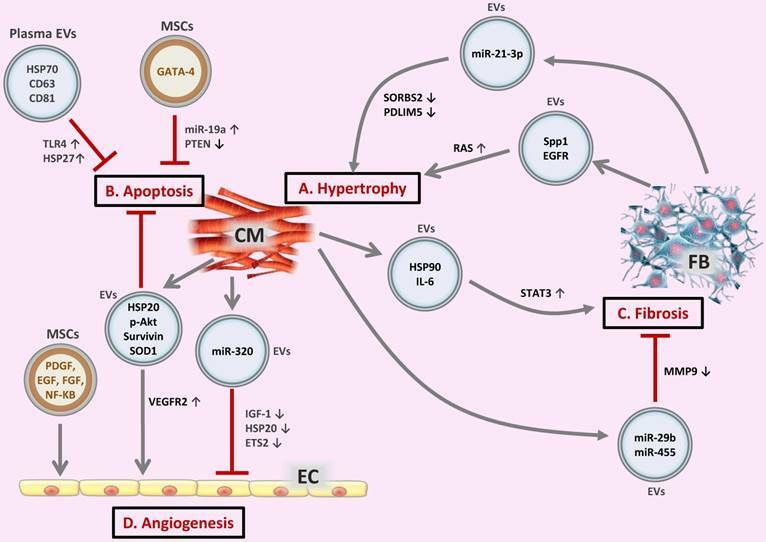 (D) EVs secreted from CMs or MSCs are transferred to ECs, exerting pro- or anti-angiogenic activities. CM, cardiomyocyte; FB, fibroblast; EC, endothelial cell; Spp1, osteopontin 1; EGFR, epidermal growth factor receptor; RAS, renin angiotensin system; HSP, heat shock protein; TLR4, Toll-like receptor 4; SOD1, superoxide dismutase 1; PDGF, platelet-derived growth factor; EGF, epidermal growth factor; FGF, fibroblast growth factor; VEGFR2, vascular endothelial growth factor receptor 2; IGF-1, insulin-like growth factor 1. Angiogenesis is an essential process for cardiac repair and regeneration after injury. CM-secreted exosomes enriched in HSP20 are also able to promote the proliferation, migration, and tube formation of human umbilical vein endothelial cells (HUVECs) through the activation of vascular endothelial growth factor receptor 2 (VEGFR2) . EVs secreted by stem cells also play critical roles in repairing CM function and in restoring angiogenic potential in endothelial cells (ECs) . MSCs exposed to hypoxia released EVs, which promoted neo-angiogenesis and preserved cardiac performance after myocardial infarction , and reduced oxidative stress and inflammation upon myocardial ischemia/reperfusion injury . The proteome of MSCs and MSC-derived exosomes released under ischemic conditions contained key angiogenic paracrine effectors including platelet-derived growth factor (PDGF), epidermal growth factor (EGF), and fibroblast growth factor (FGF); NF-kB signaling was also identified as a key mediator of MSC-derived exosome-induced angiogenesis in ECs . Additionally, EVs derived from ECs, platelets, leukocytes, and endothelial colony-forming cells also have pro- or anti-angiogenic activities . Insufficient angiogenesis is also a common manifestation of diabetic hearts, which may cause ischemic cardiovascular disorders . In adult Goto-Kakizaki rats, a type 2 diabetes model, CMs can produce miR-320-enriched exosomes and deliver miR-320 to ECs. The transferred miR-320 further inhibits the proliferation, migration, and tube formation of ECs via downregulating IGF-1, HSP20, and ETS2, which contributes to impaired angiogenesis in diabetic hearts  (Figure 2D). Taken together, EVs play important roles in the intercellular communication of CMs, FBs, ECs, and stem cells, and regulate myocardial hypertrophy, cardiomyocyte survival, cardiac fibrosis, and angiogenesis in relation to CVDs. These compensated or decompensated cardiac responses can be mediated via EVs containing a variety of signaling mediators, such as chemokines, growth factors, and non-coding RNAs (e.g. miRNAs). EVs derived from various types of cells have been widely examined for their therapeutic potential in CVDs such as acute myocardial infarction, stroke, or pulmonary hypertension [74, 81-83]. The cell sources of EVs used in experimental studies were mainly different types of stem and progenitor cells including mesenchymal stem cells (MSCs), embryonic stem cells (ESCs), cardiac progenitor cells (CPCs), dendritic cells, and others. The use of stem cell-derived EVs instead of whole stem cells is based on the theory of paracrine action of stem cells as a mechanism underlying their therapeutic action in CVDs. This theory appeared after recent evidence that the differentiation capacity of stem cells injected into the heart is minimal, thus suggesting that stem cells mediate their cardiac action via the secretion of paracrine factors including EVs containing different bioactive substances such as mRNAs, miRNAs, and proteins . Moreover, internalization of EVs by recipient cells allows transfer of bioactive molecules including drugs into the recipient cells. Thus, EVs represent a promising tool for the treatment of CVDs. Mesenchymal stem cells (MSCs) are self-renewing multipotent stromal cells that can be isolated from various tissues and have the ability to differentiate into a variety of cell types. They exert multiple biological functions including multi-lineage differentiation, anti-inflammation, tissue repair, immunosuppression, and neuroprotection . Several experimental studies have demonstrated the efficacy of MSC-derived EVs for treatment of myocardial infarction (MI) and ischemia/reperfusion (I/R) injury, documenting reduction in infarct size and improved recovery of cardiac function [65, 75, 76, 86, 87]. The beneficial effects of MSC-derived exosomes in reducing myocardial I/R injury have also been confirmed by a meta-analysis . The use of exosomes may circumvent the risks associated with the application of whole MSCs such as immunoreactivity and oncogenicity. These beneficial effects were reported to be associated with reduction of oxidative stress, activation of PI3K/Akt signaling , and increased angiogenesis [87, 89]. Proangiogenic effects of MSC-derived exosomes seem to be largely mediated via the presence of extracellular matrix metalloproteinase inducer (EMMPRIN) in exosomes . It has also been documented that injection of cardiac stem cells (CSCs) pretreated with MSC-derived exosomes enhances myocardial repair, increases capillary density, reduces cardiac fibrosis, and restores long-term cardiac function in a rat model of MI . Moreover, miRNA expression profile was significantly changed in CSCs after MSC-exosome treatment, suggesting the role of miRNAs in mediating the beneficial effects of MSC-derived exosomes . Potential involvement of selected miRNAs, particularly miR-22  and miR-223 , in the cardioprotective action of MSC-derived exosomes has also been documented in other studies. It was recently indicated that MSC-derived exosomes and whole MSCs have, in general, similar miRNA expression profiles; however the expression of several miRNAs (e.g., miR-15 and miR-21) in MSC-derived exosomes is different from that in MSCs, which may explain the better therapeutic effect of MSC-derived exosomes than whole MSCs . Additionally, favorable effects of MSC-derived exosomes on neurological recovery following stroke induced by ligation of the middle cerebral artery have been documented . Ameliorated progression of pulmonary hypertension and right ventricular hypertrophy due to MSC-derived exosomes in a mouse model of hypoxic pulmonary hypertension has also been reported . Embryonic stem cells (ESCs) are pluripotent cells derived from the inner cell mass of a blastocyst, an early-stage of preimplantation embryo. Due to their plasticity and unlimited capacity for self-renewal, ESC-based therapies have been proposed for regenerative medicine. Regarding the treatment of CVDs, less is known about the therapeutic potential of ESC-derived EVs than MSC-derived ones, which have been explored more extensively. Limited data have demonstrated that intramyocardial injection of mouse ESC-derived exosomes improved functionality of infarcted mouse hearts associated with enhanced neovascularization and CM survival, as well as reduced cardiac fibrosis 8 weeks after infarction . Moreover, ESC-exosome treatment augmented survival of cardiac progenitor cells (CPCs) and enhanced the formation of new CMs in the ischemic heart . Furthermore, miRNA array revealed significant enrichment of miR-294 in ESC-derived exosomes, suggesting that the beneficial effect of mouse ESC-derived exosomes might be due to the delivery of miR-294 to cardiac cells . ESC-derived exosomes may also reduce the risk of teratomas induced by the application of whole ESCs . For many years, the adult mammalian heart was considered to be a post-mitotic organ without the capacity for self-renewal. However, recent evidence changed this view with the identification of endogenous cardiac stem cells residing within the adult heart - cardiac progenitor cells (CPCs) [97, 98]. Given their cardiac origin, it is suggested that CPCs may represent better candidates for cardiac cell therapy compared with stem cells derived from other organs . Studies performed in the experimental MI model documented improved post-infarction recovery of cardiac function due to the treatment with human CPC-derived EVs associated with suppression of CM apoptosis and stimulation of angiogenesis . Moreover, CPC-derived EVs were enriched with miR-210, miR-132, and miR-146a-3p; increased miR-210 and miR-132 could inhibit the apoptosis of CMs and promote the tube formation of ECs, respectively . Additionally, intramyocardial delivery of mouse CPC-exosomes inhibited CM apoptosis in a murine model of acute myocardial I/R injury . Direct evidence has been found that cardiovascular progenitor-derived EVs exert a similar protective effect in preserving cardiac function after MI compared to their parent cells, indicating that these vesicles might be key mediators of cell-triggered paracrine effects . These data highlight a new perspective for using stem or progenitor cell-derived EVs of cardiac origin for the treatment of CVDs. In addition to EVs derived from MSCs, ESCs, and CPCs, other progenitor cell secreted EVs have been tested for their potential therapeutic effect in CVDs. Among them, EVs derived from dendritic cells and CD34+ stem cells (CD34 is a marker for blood- and bone marrow-derived progenitor cells, especially hematopoietic and endothelial stem cells) have been shown to induce beneficial effects in CVDs. Dendritic cells, also known as accessory cells, are antigen-presenting cells of the mammalian immune system . Dendritic cell-derived exosomes have been shown to improve cardiac function after MI via activation of CD4+ T lymphocytes , which plays a key role in improving myocardial wound healing post MI . It was also demonstrated that CD34+ stem cells expressing the pro-angiogenic factor sonic hedgehog (Shh) restored cardiac function in a mouse model of acute MI. Shh was enriched in exosomes secreted from CD34+ stem cells and transferred to and expressed in recipient cells, suggesting exosome-mediated transfer responsible for the beneficial effects of CD34+ stem cells in MI .Also, microvesicles harboring Shh ligand were reported to be able to activate Shh signaling in both ECs and CMs, and protect against myocardial I/R injury . EVs are known to be released by many different cell types and can be found in most body fluids [107-109]. There is increasing evidence about the effects of circulating EVs including their roles in cardioprotection [110, 111]. It was proposed that cardioprotective effects of remote ischemic preconditioning of the heart might be mediated by circulating EVs . In addition, platelet-derived microvesicles injected into the myocardium have been shown to induce angiogenesis and stimulate post-ischemic revascularization in a rat model of MI . Interestingly, it has been shown that plasma exosomes isolated from healthy individuals are able to protect the heart from I/R injury via activating pathways involving TLR-4 and cardioprotective HSP27 in recipient CMs . Physical exercise can further enhance the anti-apoptotic effect of circulating EVs in preventing cardiac I/R injury by activating the ERK1/2 and HSP27 signaling pathways . Taken together, EVs derived from different types of stem cells exert evident beneficial effects in MI, I/R injury, stroke, and pulmonary hypertension, suggesting their therapeutic potential for the treatment of different CVDs. The cardioprotective actions of stem cell-derived EVs seem to be mediated via suppression of apoptosis, stimulation of angiogenesis, reduction of oxidative stress, activation of PI3K/Akt signaling, and notably, via delivery of specific miRNAs that are significantly enriched within EVs (Figure 3A). Moreover, circulating EVs might exert cardioprotective effects as well, most likely via activating known cardioprotective intracellular pathways (Figure 3B). The detailed mechanisms underlying the beneficial effects of exogenous or endogenous EVs in the treatment of CVDs remain to be fully clarified. Lastly, although EVs represent a promising source of therapeutic agents, certain limitations still need to be solved such as the difficulty to obtain sufficient amount of EVs and the methods for bioengineering of EVs. The approaches to permit the arrival of EVs at specific target tissues or cells as well as to enhance their biological activities are also required to be developed. EVs carry biological cargos derived from parent cells [114, 115], which depend on the status of the original cells at the time of EV biogenesis [116, 117]. The bilayer lipid membrane of EVs acts as an efficient protection barrier for their inner molecules, thus contributing to their stable measurements in body fluids . Therefore, EVs are not merely cell debris, but biological illustrations of the individual health status, which may be potential fingerprints of diseases [119, 120]. However, study of EV-based biomarkers for CVDs is still in its infancy. The current knowledge about EVs as diagnostic and prognostic biomarkers in CVDs has been gracefully reviewed by Jansen et al. . Here we focus on EVs as well as the change in EV contents, including miRNAs, RNAs, proteins, and lipids, as potential biomarkers in CVDs. Stem cell-derived extracellular vesicles (EVs) and circulating EVs have potential therapeutic effects in cardiovascular diseases (CVDs) EVs derived from different types of stem cells (e.g., MSCs, ESCs, CPCs, and DCs) (A) exert evident beneficial effects in MI, I/R injury, stroke, and pulmonary hypertension, which are mediated via suppression of CM apoptosis, stimulation of angiogenesis, reduction of oxidative stress, and attenuation of fibrosis. Circulating EVs (B) also reduce CM apoptosis and protect against I/R injury. MSC, mesenchymal stem cell; ESC, embryonic stem cell; CPC, cardiac progenitor cell; DC, dendritic cell; CM, cardiomyocyte; MI, myocardial injury; I/R, ischemia/reperfusion. EVs incorporating miRNAs, as potential diagnostic and prognostic biomarkers in diverse cardiovascular pathologies and associated metabolic diseases, are one of the most widely investigated EVs. Under acute coronary syndromes (ACS) and MI, injured CM-released EVs were enriched with cardiac- or muscle- specific miRNAs . A study showed that circulating exosomal miR-133a had higher concentrations in patients with ACS than normal control . Compared with cardiac troponins (troponin I and troponin T), exosomal miRNAs such as miR-1 and miR-133a/b could show faster and earlier changes in circulation upon acute MI . Other studies reported that the expression levels of miR-1 and miR-208 incorporated in exosomes were significantly upregulated in the urine or serum samples of patients with ACS or MI [124, 125]. The increase in serum exosome-derived miR-208a was associated with higher Killip class, higher CK-MB peak, higher cTnT peak, and reduced 1-year survival rate . Additionally, high levels of vascular and endothelial cell-derived miRNAs (miR-126 and miR-199a) in circulating microvesicles were associated with a lower major adverse cardiovascular event rate in patients with stable coronary artery disease . In patients with heart failure, exosomal miR-423-5p, miR-320a, and miR-22 in the serum had higher concentrations than in healthy controls . Moreover, under different pathologies of heart failure, specific EV-associated miRNAs were differentially regulated . Compared with post-AMI patients without heart failure, exosomes containing circulating p53-responsive miRNAs (miR-192, miR-194, and miR-34a) showed up-regulated concentrations in the group who developed heart failure after AMI . The level of circulating miR-146a was decreased in the patients with peripartum cardiomyopathy after undergoing the standard therapy of heart failure, indicating that miR-146a might serve as a promising biomarker for peripartum cardiomyopathy-associated acute heart failure . The same study also demonstrated that EC-derived exosomes could transfer miR-146a to CMs, thus reducing the metabolic activity of CMs . In patients with type II diabetes, the quantities of circulating EVs increased . In addition, the study showed that CMs could secrete exosomes containing higher levels of miR-320, reducing angiogenesis under diabetic condition. In patients with metabolic syndrome, circulating levels of exosomal miR-17, miR-197, miR-509-5p, miR-92a, and miR-320a were significantly increased compared to healthy control group . Some researchers analyzed total RNAs in CM-derived EVs and compared their profiles with original cells; the results showed that 1520 mRNAs were shared by EVs and their parent cells . Recently, it was demonstrated that low mitochondrial cytochrome oxidase-1, a marker of mitochondrial oxidative stress, in monocytes and monocyte-derived microvesicles is associated with the outcome in patients with coronary artery disease . Specific proteins can also be enriched in EVs, serving as potential biomarkers for CVDs. Exosomes derived from hypoxic CMs mediate TNF-α production, which is detrimental to CMs via autocrine mechanism during MI . Both in vitro experiments under hypotonic conditions (143 mOsm/kg; osmotic stretch) and in vivo studies using a model of pressure overload suggested consistent results; exosomes derived from CMs contained up-regulated levels of AngII type 1 receptor (AT1R) . Further, to explore EV proteins in plasma as diagnostic biomarkers for MI, quantitative proteomics profiling was applied and 6 up-regulated proteins that reflected key factors in MI progression were finally picked up . Another study showed that 3 selected proteins from circulating EVs, including polygenic immunoglobulin receptor (pIgR), Cystatin C, and complement factor C5a (C5a) were independently associated with ACS and the association was markedly stronger in men . Interestingly, the microvesicle protein levels of Cystatin C, Serpin F2, and CD14 predict high risk of future vascular events and mortality in patients with clinically manifest vascular disease . Lipidomic analysis showed that exosomes derived from palmitate-treated muscle cells were enriched in palmitate, which were supposed to transfer the deleterious effect of palm oil to distal organs, including the heart, in a lipid-induced insulin resistant mouse model . However, studies on EVs containing lipids as potential biomarkers in CVDs are currently limited. Lipidomics may facilitate the identification and quantification of lipids in EVs as well as reveal their values as an indication of pathogenic processes of atherosclerosis and other cardiovascular disorders . In summary, the EV counts and/or the levels of EV-incorporated contents are significantly altered in patients with CVDs. EVs protect their cargos and make them more stable in blood circulation, thus EVs and their bioactive contents may serve as more reliable biomarkers than freely circulating biomarkers. Moreover, the comparison or combined use of EVs with currently used biomarkers may raise hope for identifying a novel set of biomarkers with more sensitivity and specificity in CVDs. Innovative stem cell therapies in patients with CVDs have created exciting possibilities for repairing damaged myocardium and improving quality of life [142-145]. Although stem cell transplantation therapy shows promising treatment benefits, the major regeneration potential is resulted by the release of paracrine factors . Growing evidence demonstrates that the paracrine factors contribute mainly through EVs, which carry signaling molecules to adjacent and distant places during disease progression . In this respect, EVs derived from stem cells may serve as a surrogate for stem cell-therapy, which may also bring advantages to reduce or avoid limited source and low viability of stem cells, adverse immune rejection, and oncogenicity . Despite the growing evidence showing the benefit of EV-based therapy, there is currently a lack of dependable protocols for the selection of EVs from any given source. There is also an urgent need to establish a reliable universal protocol for isolation, purification, and large-scale production of EVs [35, 149]. One study demonstrated that EVs derived from umbilical cord MSCs when isolated by size-exclusion chromatography (SEC) have higher immunosuppressive effect compared to non-EV containing fractions or less purified EV fractions . The study mentioned above shows a significant variation in the immunosuppressive effect between these techniques. Thus, EV isolation and purification techniques are critical in analyzing the treatment benefits of EVs. In contrast, another study has revealed that the post MI treated with total conditioned medium derived from neonatal cardiac progenitor cells (nCPCs) shows significantly higher functional benefits when compared with nCPC-derived exosomes . This superior beneficial effect observed in the total conditioned medium is associated with multiple biological factors secreted by nCPCs such as proteins, mRNAs, and EVs . Thus, further studies are needed to delineate the therapeutic importance of the total conditioned medium versus purified EVs available within the culture system. The advanced digital detection of EVs, through techniques like Single Particle Interferometric Reflectance Imaging Sensor (SP-IRIS) , may be useful tools to understand the therapeutic usage of EVs in various CVDs. Besides the beneficial treatment effects of EVs, the off-target effects of EV-based therapy may also be seriously evaluated; one example is that human bone marrow MSC-derived EVs were reported to stimulate tumor vascularization in vivo .On the other hand, determination of the cellular source and the route of administration may further enhance the therapeutic efficiency of EVs [154, 155]. Enrichment or modification of selected contents in EVs may also be an important strategy to improve EV-based therapy [65, 156]. EVs, unlike cells, need not be viable to be functional and can maintain their integrity during freezing and thawing procedures. EVs are naturally stable and possess many membrane adhesion proteins for efficient binding and retention in the target tissues during transplantation. The presence of a resistant membrane for EVs makes it possible for long-term storage without biological degradation, which is an advantage in multiple transplantation options for patients. Moreover, miniscule EVs and their own biological molecules have the capacity to evade the host immune system and circulate all over the body to perform their functions. These advantages make EVs ideal drug delivery vehicles compared to liposomes and polymeric nanoparticles . EVs can be loaded with various types of therapeutic cargos including miRNA, siRNA, mRNA, and proteins [156, 158]. It was recently found that when comparing exosome preparations from plasma and urine from healthy and oncologic disease patients, the plasma contains the highest level of non-vesicular contaminants that are similar in size to the exosomes . To overcome these non-vesicular contaminants, several studies have shown the development of artificial nanovesicles (exosome-mimetic nanovesicles), which can be a platform for siRNA delivery to recipient cells [160, 161] and were recently demonstrated to function similar or even better than the natural exosomes derived from adipose stem cells . Further studies are needed based on the inner contents and the biological functions of natural exosomes to generate the relevant exosome-mimetic nanovesicles according to its necessity, which may have desirable advantages over natural exosomes in relation to their half-life, isolation, purification, and control of immune reactions . In the future, one may consider personalized exosome-mimetic nanovesicles as a novel drug delivery system for a wide range of therapeutic molecules such as nucleic acids, proteins, miRNAs, and siRNAs. EVs are potential biomarkers for CVDs; however, many issues remain unsolved . The exact mechanisms of cargo selection and packaging as well as the interactions between EV contents and target cells have not been completely understood. Besides exosomes, microvesicles and apoptotic bodies are also circulating protective carriers of biological contents, which call for further investigation. The similar variation of EV quantities or contents can be observed under different pathological conditions, and more efforts are needed to improve both the sensitivity and specificity of EVs as biomarkers for CVD diagnosis, prognosis, and treatment . Moreover, time-dependent EV release kinetics in CVDs should be examined instead of measurement at one time point . In order to conduct further studies for validating EVs as biomarkers in CVDs, large randomized clinical trials with carefully selected control groups are needed . Currently, a number of clinical trials are ongoing. The human beta cell-released EVs in the blood circulation may trigger the immune responses in the early stage of type 1 diabetes (NCT03106246). Ticagrelor was supposed to reduce the release of platelet EVs in patients with acute MI (NCT02931045). These clinical trials may push forward the applications of EVs in clinical monitoring of diseases as well as their use as biomarkers in CVDs. Meanwhile, clinical applications require efficient detection protocols and methods for circulating EVs and their components, which may depend on the progression of novel technology. In general, to establish EVs as biomarkers in CVDs, convincing clinical trials as well as efficient and standardized detection methods are prerequisites. Transplanting EVs is more stable than stem cells and has the potential to avoid many limiting encounters in cell therapy applications in regenerative medicine . However, the utility of EVs in the field of regenerative medicine is currently in infancy due to an inadequate understanding of EV nature during normal and disease conditions and thus making it unpredictable for long-term therapeutic safety. Despite this, the few drawbacks that exist with stem cell-derived EVs need to be solved before entering regenerative therapy. The main concerns are developing novel methods of manufacturing pure populations of EVs, identifying a safe stimulant that induces a release of large quantities of EVs in the culture medium, finding information on EV-mediated intercellular signaling pathways involved during cellular injury and repair processes, examining the major differences in the EV cargos during the degenerative and regenerative processes, identifying the optimal source of cells to generate the beneficial EVs, examining immune reactions triggered by the minimal human leukocyte antigen present in the membrane of EVs, and identifying the role of EVs in the residential stem cells. To solve all these problems, interdisciplinary studies are required in a timely manner. Once these problems are resolved, EVs will provide a great tool as therapeutic interventions in regenerative medicine. 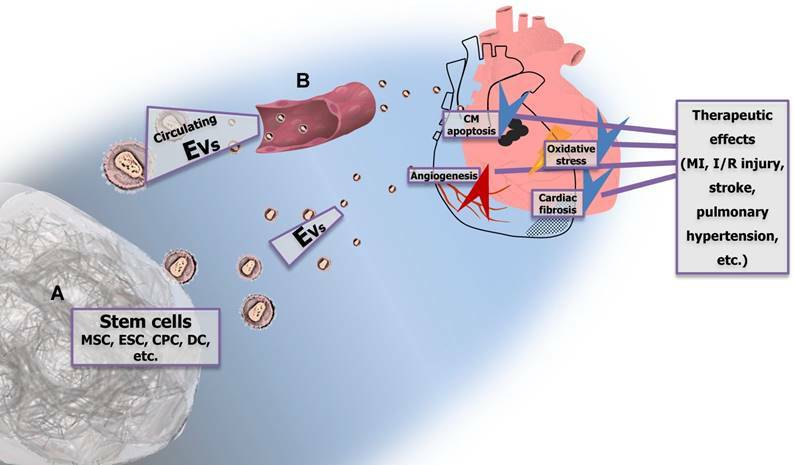 EVs are involved in various functional behaviors of cardiac cells as well as intercellular communication, and critically participate in the pathophysiological progression of CVDs. The natural characteristics and functional roles of EVs make them potential candidates as therapeutic agents and biomarkers for CVDs, though novel technology and universal protocols for EV isolation, purification, and detection need to be developed. Moreover, being able to decode the EV cargos and transferred signals will provide us with valuable information during different stages of CVDs, spanning from early diagnosis to clinical intervention and monitoring. EV: extracellular vesicle; CVD: cardiovascular disease; ISEV: International Society for Extracellular Vesicles; miR: microRNA; CM: cardiomyocyte; FB: fibroblast; MAPK: mitogen-activated protein kinase; RAS: renin angiotensin system; EGFR: epidermal growth factor receptor; HSP: heat shock protein; SOD1: superoxide dismutase 1; TLR4: Toll-like receptor 4; TGF-β: transforming growth factor-β; ET-1: endothelin-1; AngII: angiotensin II; CTGF: connective tissue growth factor; PDGF: platelet-derived growth factor; HUVEC: human umbilical vein endothelial cell; VEGFR2: vascular endothelial growth factor receptor 2; EC: endothelial cell; EGF: epidermal growth factor; FGF: fibroblast growth factor; IGF-1: insulin-like growth factor-1; MSC: mesenchymal stem cell; ESC: embryonic stem cell; CPC: cardiac progenitor cell; MI: myocardial infarction; I/R: ischemia/reperfusion; CSC: cardiac stem cell; Shh: sonic hedgehog; ACS: acute coronary syndromes. This work was supported by grants from National Natural Science Foundation of China (81722008, 91639101 and 81570362 to JJ Xiao, 81400647 to Y Bei), Innovation Program of Shanghai Municipal Education Commission (2017-01-07-00-09-E00042 to JJ Xiao), Science and Technology Commission of Shanghai Municipality (17010500100 to JJ Xiao), the development fund for Shanghai talents (to JJ Xiao), the National Institutes of Health (NCATS grant UH3 TR000901 to S Das), the Interdisciplinair Ontwikkelingsfonds‐Kennisplatform (Centre of Excellence KP/12/009 to P Holvoet), the grant VEGA SR (no. 2/0061/16 to M Bartekova), the American Heart Association (16GRNT30950010 to J Rajasingh), and National Institutes of Health (COBRE grant P20GM104936 to J Rajasingh).